How Much Have Obamas Spent On Clothes? It’s kind of funny to me. When John McCain and Sarah Palin point out that Barack Obama “palled around” with terrorist William Ayers (“partnered with” is a better way to put it), the all-over-the-air and way-over-the-top Democratic talking point was that this was an attempt to take attention away from the “real issues.” Journalists told us that with so many issues of profound importance facing the country, focusing on something as trivial as a terrorist buddy was ridiculous. And then the “bombshell revelation” that the McCain-Palin campaign might have spent $150,000 outfitting Sarah Palin and upgrading her image for the campaign hits like some major scandal. And THAT’S relevant! You don’t hear the drive-by mainstream media condescendingly pointing out how irrelevant Sarah Palin’s wardrobe is, or how this is a clear attempt to distract the public from the damage created by the “Joe the Plumber” situation. Nope. The media would never dare apply the same talking points to Republicans that they routinely use to justify and support Democrats. Goebbels never turned on Hitler, you know. In any event, I read a few condescending stories from the leftist media (such as the Huffington Post), but couldn’t find any reference to what Barack or Michelle Obama spent on their clothes. I think it’s pretty safe to say that they’ve both spent a ton of dough. The Politico article says that, “A review of similar records for the campaign of Democrat Barack Obama and the Democratic National Committee turned up no similar spending.” But keep in mind that every penny of McCain campaign money is accounted for due to public financing regulations, whereas we have no idea where more than $200 million of Obama’s money came from. And we also come to find out that designers have given wardrobes to Democratic candidates in order to garner publicity, which itself amounts to a violation of campaign laws. One of Mrs. Clinton’s famous political fashion designers, Susanna Chung Forest, who designed Hillary’s pantsuits, which, that’s gotta boost the resume. She says that it would be unusual for a candidate as famous as Sarah Palin to need to buy clothes at all, meaning most of these women are not buying their clothes, they’re given to them by the designers in order to get publicity, just as Hollywood starlets on the red carpet before the Emmys and the Oscars, those gowns are all donated. The current issue of Harper’s Bazaar notes that the Democratic presidential candiate’s wife wears Valentino, among others. Looks like when the Obamas say “spread the wealth around,” they mean at top shelf department stores. I’m not outraged at this. The pressure of being in the public eye is understandable. 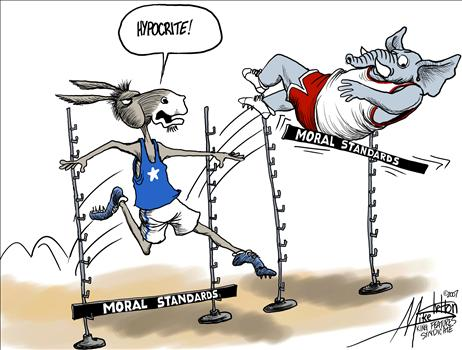 What’s disturbing is the double standard. Michelle Obama gets hailed by the fashionistas while Palin gets crucified and mocked by the fashion police. These same liberals who are now appalled at the Palin shopping spree are the same ones that thought it shallow and superficial to discuss Newsweek’s obvious recent cheap shot cover of Sarah Palin because we have more important fish to fry. Where are these people now to shout that this issue is trivial? And how do they manage to get so fired up about Palin’s appearance all of sudden? This latest attack on Sarah Palin is geared to undermine her as a real “woman of the people.” But the reality is that it shows that she IS a woman of the people. She didn’t have the kind of clothing that would withstand the unrelenting glare of the national spotlight. How many “women of the people” do? This woman who sold the governor’s private jet, got rid of the governor’s limosine, fired the governor’s chef, etc. clearly IS a “woman of the people” whether the McCain campaign upgrades her image or not. And given the fact that the Obama campaign has easily outspent the McCain campaign 4-1, what does it matter that the McCain campaign believed that upgrading the image of an attractive candidate was money poorly spent? The McCain campaign has reported that the clothes will be sold off and the proceeds donated to charity after the election.